Encourage yourself in Me, even as David of old did, when his city was burned, his goods stolen, and his family was taken into captivity by the enemy. You can take heart in the worst circumstances, by knowing that I Am GOD, in the very midst of you, says the LORD. I Am the GOD of all comfort. I will comfort you in any trouble, and you will be assured that you do not stand alone. I will be with you in trouble, to bring you out of it. 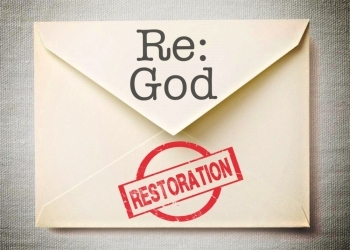 I will restore you, even as I did, David. You are not exempt from the trials of your faith, even as others have suffered for a time. The times and seasons will change, but I will not. I remain your help in times of trouble, says the LORD. Your enemies are My enemies, and I Am on your side. I will not allow the enemy to overrun you, and his diabolical weapons poised against you will not destroy you. I will fight for you, and you will overcome. I Am with you to give you GOOD success, not troubles and trials. I will not only empower you to overcome, but you will overwhelm the enemy. I will fortify you as a walled city, and defend you by Myself. Lift up your head, and be encouraged. Be comforted, for the battle that is yours, is already mine, and I will never lose a battle or the war. I will secure you, and bring you to certain safety, as you rely upon Me, and restore you, says the LORD.